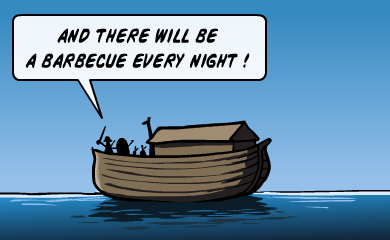 Secular Scientists…the Present Day Noah! Home / engaging / Secular Scientists…the Present Day Noah! As for Noah, Bill Leonard asks a bunch of questions – good ones. Be wise. Listen to his awesome visit to the podcast & go check out his post on Noah. When did the people of Noah’s day finally realize that what was happening to them was more than just a stationary front? Why do some religious folks take the Noah story literally but resist the possibility of a contemporary global catastrophe, one essentially of human creation? Wouldn’t it be weird if “secularists” turned out to be the ones who discerned earth’s impending judgment on our lives and lifestyles? What if global warming is true and we don’t have sense enough to see the planet itself as ark? Like Noah, we still could labor together to find “grace in the eyes of the Lord.” Or just turn up the church air conditioning.